New trends are changing so fast! At Gemaco, we’re always curious for discovering brand new things. That’s why we travelled thousands kilometers looking for some fresh inspiration. We stopped at several Far East trade shows and numerous European ones. Technology is a timeless thing, man will never stop innovating. That’s what we are excited about! We’re curious about every single gadget arising. Nowadays, it’s synonym of wireless charging, smart techs, innovative music listening gear and so many other possibilities. What about the years to come? We’re not able to give you clear predictions, but we’re sure that these unknown things to come will be even more spectacular! Sustainability is once again in the top trends. It’s never been that unneglectable to take care of our planet. That’s what we’ve always worked for at Gemaco. So, we’ll be pleased to propose you plenty of easy and funny alternatives to embrace this ‘go green’ attitude. In a century where we can’t imagine a day without our smartphone sticking to our fingers, Youthfulness is the new hot topic! We need to live, share, laugh and smile with our friends and family. There’s a real need to reconnect to the real values of life. So, put your smartphones away from time to time and live your life to the fullest! Functionality is the last trend we spotted. We noticed that people are bored. Tired from the system and tired from seeing always the same kind of gadgets in marketing industry. What’s the difference your brand is proposing to them? You need to come up with value added and useful new things! 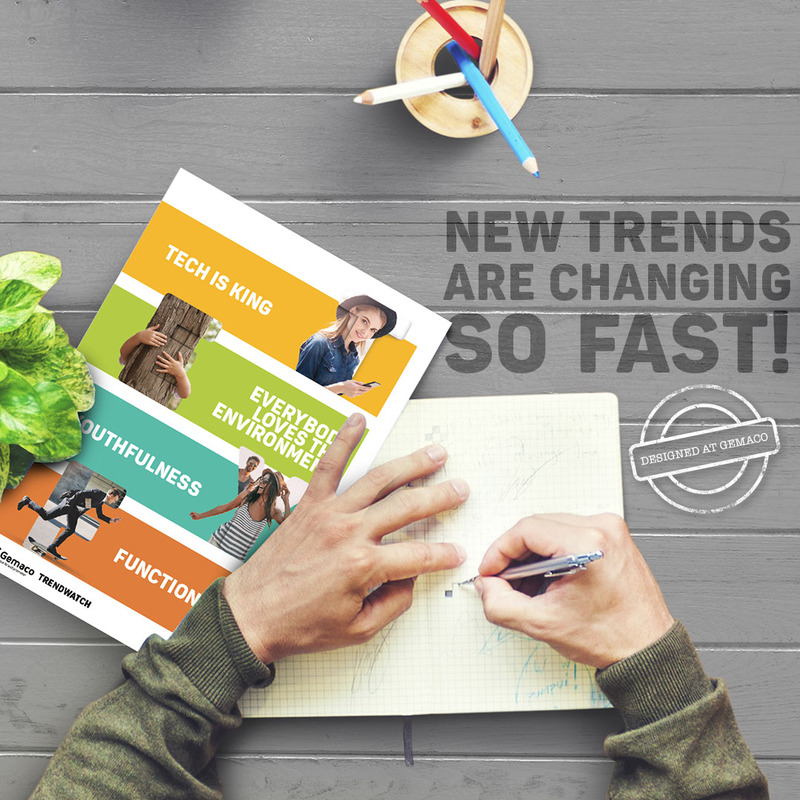 Curious about reading our entire Trendwatch Report? Or curious about what we have in mind for your brand? Contact your account manager to receive your copy!